For all of you people plugging away at social media marketing, this is a pretty big deal. those aren’t necessarily the best channels for brands to drive sales. 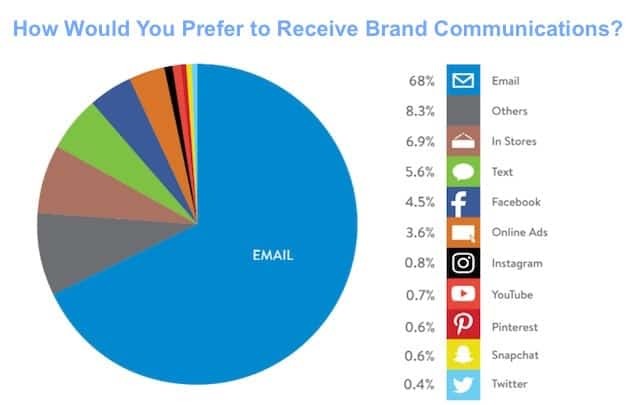 Most consumers say they prefer to receive brand communications from retailers via email, according to recent research from Bluecore. 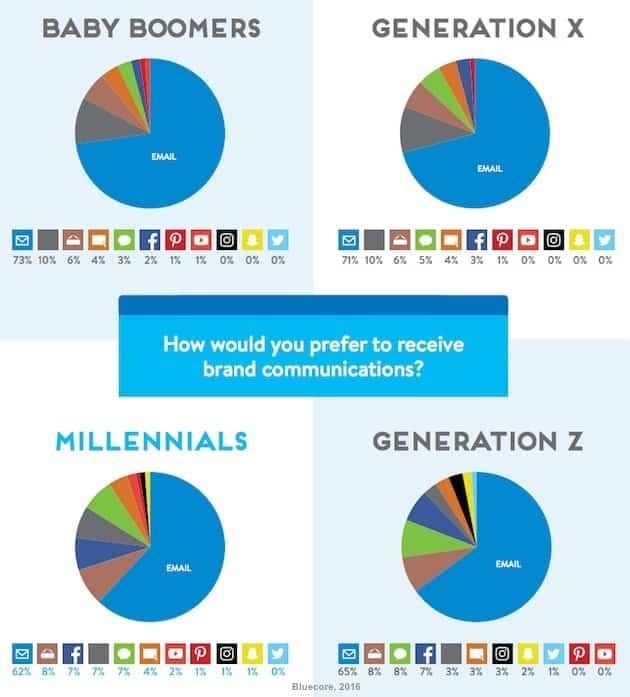 Email is the most preferred brand communication channel for respondents in all generations, including Baby Boomer (73% prefer email), Generation X (71%), Millennial (62%), and Generation Z (65%) consumers. Twitter, Instagram, YouTube and Pinterest come in under the one percentile lower than online ads as the preferred method of brand communications. Facebook comes in 5th with only 4.5% preference, lower than text messaging. This is NOT limited to Millennials, however. Since social media channels have come into existence, brands have been trying to figure out how to leverage them as sales channels for consumers. If brands wanted to sell to women, they thought they had to get in front of them on Pinterest. Needed to reach young men? YouTube was the channel of choice. However, when consumers were asked which channels they check to learn about new products from brands, 36 percent say they don’t turn to any social channels at all. Boomers (59 percent) and Generation X (43 percent) were least likely to check social channels, followed by Millennials (33 percent). Which channels do you check to learn about new products?